Shop Prescription Savings Club Individual Membership Card (1 ea. )1 ea. Shop Prescription Savings Club Family Membership Card (1 ea. )1 ea. Shop Prescription Savings Club Renew Individual Membership Card (1 ea. )1 ea. Shop Prescription Savings Club Renew Family Membership Card (1 ea. )1 ea. 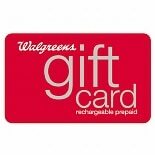 Shop Walgreens $25 Rechargeable Gift Card (1 ea. )1 ea.